Home Depot (HD) began operating in 1978, approximately 32 years after Lowe’s (LOW) was founded. Despite its later start date, Home Depot is now the world’s biggest home improvement retailer with over $100 billion in annual sales. The company has more than 2,200 retail stores and maintains the number one market share position in the U.S., Mexico, and Canada. Home Depot’s stores carry around 35,000 items covering a wide variety of building materials, lawn & garden products, and home improvement products. Its online catalog maintains over 1 million products. Online sales represent a little over 6% of Home Depot’s total revenue (double its nearest traditional competitor) and have grown by approximately $1 billion in each of the last four years. The majority of the company’s customers are do-it-yourself consumers, who account for close to 60% of Home Depot’s total sales. Professional contractors, who only account for around 3% of Home Depot’s total customer base, generate over 40% of the company’s total sales because they spend much more on projects each year (the average pro customer spends more than $6,000 per year with Home Depot). Home Depot’s dominance in the home improvement market primarily stems from its economies of scale, strong brand recognition, valuable real estate locations, supply chain expertise, customer service, and leading breadth of products and services. As the largest player in the market, Home Depot is the low-cost provider and can afford to offer one of the broadest lineups of products and services while investing in in-store displays and service staff to help customers get everything they need for their next project. Home Depot’s employee base is another advantage. The average tenure of store managers is over 14 years, and more than 90% of department supervisors started as sales associates, per the company. This helps Home Depot provide more consistent project support to customers shopping in the store. Home Depot also enhances its customer experience by partnering with suppliers to bring innovative and exclusive items to the market that help customers save time and money. Many suppliers depend heavily on Home Depot and have little bargaining power. Smaller rivals simply cannot match Home Depot’s offerings, breath of merchandise, brand recognition, customer experience, and price points. The company’s extensive IT systems and supply chain form other competitive advantages. Moving and selling millions of products across the country is almost mind-boggling, but Home Depot has developed the extensive know-how needed to be a successful retailer. This is particularly important when it comes to e-commerce. The company is focusing on creating a better customer experience, increasing the connection between its stores and website. Home Depot has been opening massive direct fulfillment centers to meet the needs of online shoppers, and its extensive store base is proving to be an increasingly valuable asset. In fact, management notes that 90% of the U.S. population lives within a 10-mile radius of a Home Depot store. Approximately 45% of the company's online orders are picked up in the store, and over 85% of online returns are completed in Home Depot stores. In other words, the company's brick-and-mortar locations are clearly the hub of an interconnected Home Depot experience for customers. However, the company is aggressivly investing to make its online deliveries more convenient, too. In December 2017, Home Depot announced plans to invest $1.2 billion over the next five years to enhance the speed and efficiency of its delivery network. Upon completion of these investments, the company estimates that 90% of the U.S. population will have same day delivery, which is all the more impressive when you consider the large and bulky goods Home Depot ships, such as lumber, appliances, and roofing materials. The digital and storefront investments the company is making should improve Home Depot’s ability to scale and better meet the needs of online shoppers. Smaller rivals with less cash to invest and a smaller store network cannot keep up with Home Depot. As a result, it wouldn't be surprising to see the market consolidate further over the next decade. Finally, with so many different products and a constant need to maintain properties, the home improvement market has simply proven to be resilient and slow to change over the years. A handful of major players control the majority of this mature market, making it very difficult for new entrants to disrupt the space. All of these qualities have helped management deliver on their financial objectives over the years. Home Depot first established operating margin and return on invested capital targets back in 2009. Since then, management has raised the targets every two or three years. Most recently at its investor day in 2015, the company targeted operating margin expansion from 13% to 14.5% and an improvement in return on invested capital from 27% to 35% by fiscal 2018. Home Depot exceeded its margin target in 2017 and is on track to achieve its return on invested capital target this year. Looking ahead, management's fiscal 2020 financial targets call for 4.5% to 6% annual sales growth, steady to slightly higher operating margins as profits are reinvested, and an increase on return on invested capital to 40%. The end result should be mid to high single-digit annual earnings growth over the next few years. Despite its industry-leading size and $101 billion revenue base today, the company still has room for plenty of profitable growth. 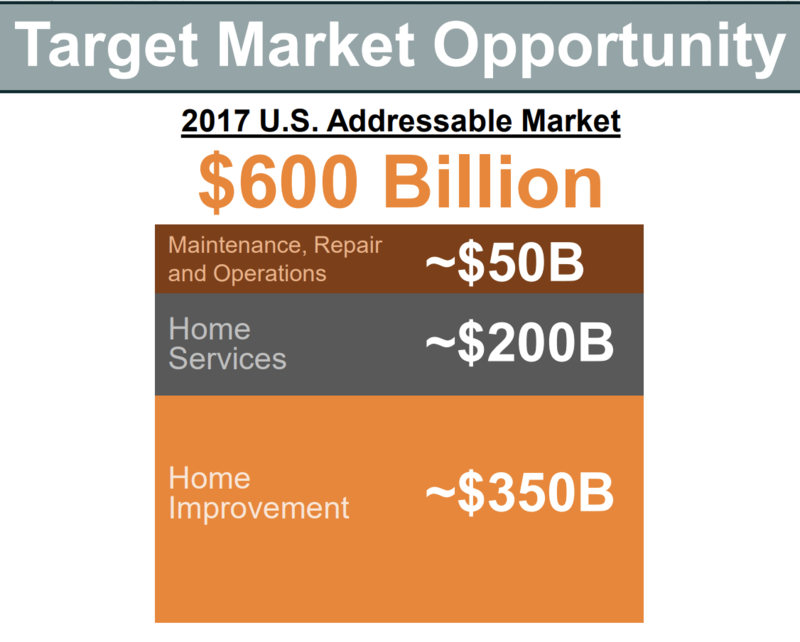 Home Depot estimates that its addressable market in the U.S. is $600 billion, with the home improvement market accounting for $350 billion and services representing $200 billion. Maintenance, repair, and operations account for the remaining $50 billion. In other words, Home Depot currently has less than 17% market share in the U.S. and sees room for continued expansion, particularly in services (less than 5% market share), online sales (just over 6% of company-wide sales), and business with professional contractors. Home Depot will likely remain a force for a long time. Over short periods of time, Home Depot’s business is most sensitive to U.S. GDP and the housing market. Higher housing values cause many homeowners to view their homes more as an investment rather than an expense and have helped housing turnover return to its normalized rate following the financial crisis, resulting in higher purchases of goods and services from home improvement retailers. While an unexpected slowdown in the economy and/or housing market would potentially hurt Home Depot’s near-term earnings, these events have little bearing on the company’s long-term earnings potential. The bigger risks facing Home Depot are changing demographics, evolving customer shopping preferences, and potential market saturation. 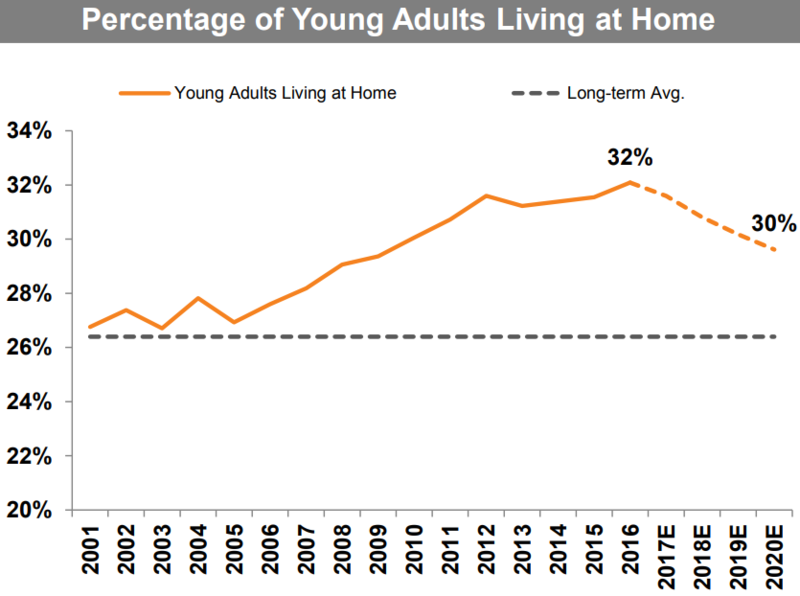 For the first time ever, more Americans 18 to 34 years old live in their parents’ house than with a partner in their own home, according to data cited by Bloomberg. It’s difficult to say what impact the Millennial generation’s different housing choices will have on the home improvement retail market, particularly if Millenials continue brining the home ownership rate lower. Another demographic risk is that the aging population shifts a lot of work from do-it-yourself customers to professional contractors. However, Home Depot already generates around 40% of its sales from contractors and is positioning itself for this trend by adjusting its organization to have a group dedicated to solving the needs of contractors. Perhaps the biggest uncertainty facing all brick-and-mortar retailers is the rise of e-commerce and how customers shop. Home Depot has said that close to 60% of customers now start their buying journeys online before they even enter a Home Depot store. Consumers can now buy virtually any product they desire using just the phone in their pockets – there is no longer as great of a need to visit huge stores to find what you need. In other words, store size is not quite the advantage that it was 10 years ago, potentially creating opportunity for lower-cost internet retailers to begin stealing market share. Home Depot has long been taking steps to fight off potential e-commerce competition. The company’s digital business has grown by roughly $1 billion in each of the last few years and now accounts for over 6% of company-wide sales. Home Depot is fortunate to participate in many product categories that are less susceptible to online competition. Many products sold by home improvement retailers are for unique projects that require a hands-on evaluation and some consultation. For example, a do-it-yourself remodel project requires the consumer to review paint colors, flooring designs, cabinet options, and more. Figuring out all of the materials needed is also difficult. Home Depot’s online store is a major help and interconnects with its brick-and-mortar operations. As we previously discussed, approximately 45% of the company’s online orders are picked up inside of a Home Depot store. With more than 2,200 store locations across North America, Home Depot is better able to provide customers with omni-channel convenience compared to its smaller rivals. Home Depot’s scale also gives it a leg up in e-commerce. The company has several massive direct fulfillment centers across the country that allow it to reach most of its U.S. customers in two business days or less when shipping directly to a home or job site. Once again, smaller rivals cannot afford to make these investments, strengthening Home Depot’s hold on the number one market share spot. Aside from demographics and changing customer preferences, market saturation is probably the biggest risk challenging Home Depot’s long-term earnings growth trajectory. It’s hard to say how many big box home improvement retailers the country needs. Home Depot’s efforts to expand its addressable market into services and MRO markets (e.g. its $1.7 billion acquisition of MRO player Interline Brands in 2015) could be an indication that growth opportunities in traditional home improvement are nearing capacity – especially given its status as the largest player in the market. Overall, Home Depot doesn’t appear to face many critical risks. Its strong brand, massive store base, economies of scale, leading e-commerce operations, and valuable real estate will keep it relevant and generating cash for many years to come. From a fundamental perspective, there’s not much to dislike about Home Depot. The company maintains the largest market share in the home improvement retail industry, benefits from economies of scale, is a supply chain expert, and is positioning itself to remain relevant for years to come by investing aggressively in e-commerce. Home Depot is a prime example of a blue-chip dividend stock, including a track record of uninterrupted payouts since making its first quarterly dividend payment in 1987. Consistent free cash flow generation, time-tested operations, a strong brand, healthy payout ratios, and steady earnings growth all contribute to the company’s solid long-term dividend growth story.